STIMEX® CASETTE TANK CLEANER - STIMEX® Nederland B.V. STIMEX® CASETTE TANK CLEANER - STIMEX® Nederland B.V.
STIMEX® Cassette Tank Cleaner is a highly concentrated liquid, especially designed to help thoroughly clean the waste tank/cassette of the chemical or portable toilet. 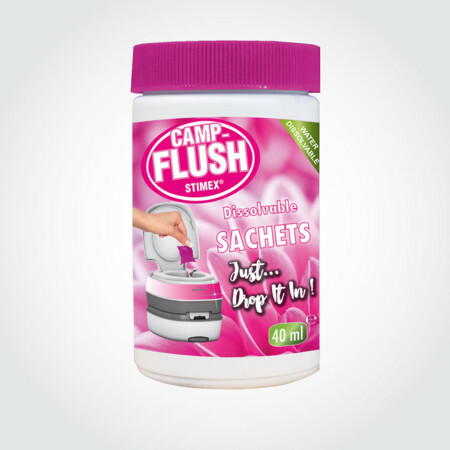 This product brakes down, softens, hygienically cleans and removes waste and residue from the waste/cassette tank of the toilet.To achieve an optimal result it is recommended to clean the waste tank/cassette approximately 4 times per year. Instructions: First rinse the waste tank/cassette with clean water. Fill the empty waste tank/cassette with approximately 250 Ml. of Stimex Cassette Tank Cleaner. Than add warm (max. 45°C / 113°F) water until the tank/cassette is half way filled. Now shake the tank/cassette back and forth so the whole tank is being cleaned. (Suggestion: place the tank/cassette in your car or caravan while driving using the motion of the vehicle to clean the tank/cassette). Let the dilution soak for approximately 24 hours for an optimal result and than empty the content of the waste/cassette tank at a designated place. Thoroughly rinse the waste/cassette tank once more with clean water. Stimex Cassette Tank Cleaner is harmless to the seals of the waste/cassette tank. To avoid clogging it is advised to use Stimex Camp Blue (for the waste/cassette tank of the toilet), Stimex Camp Flush (for the Flush Tank of the Toilet) and rapid dissolving Stimex Camp Soft toilet paper when using the toilet. Safety Regulations: Causes serious eye irritation – Wash hands thoroughly after handling – Wear eye protection – IF IN EYES: Rinse cautiously with water for several minutes. Remove contact lenses, if present and easy to do. Continue rinsing – If eye irritation persists: Get medical advice/attention. Keep out of the reach of children.